It’s really a headache sometimes, to think of a meal that I can involve the children in the preparation. With the kid running into the kitchen, constantly asking “Mama, can I help?”, I just can’t turn her away just like that. 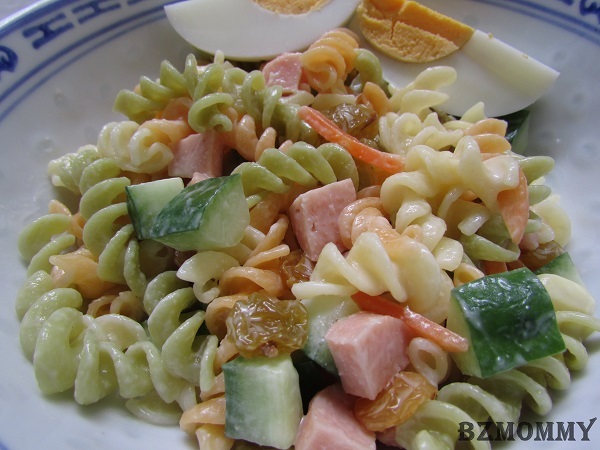 I decided to make Pasta Salad today, for something different and also an easy way to involve Dawn in the process. Grill the hot dogs (or you can boil them). Once done and cooled, dice and set aside. Boil the eggs for 8-10 mins - Hard Boiled eggs. Peeled the eggs (Get the kids help! ), slice them using an egg slicer or cut them to quarters, set aside. Cut the carrots to stripes or cubes. Steam the carrot with the sweet corn (or you can boil the carrot and take them out and re-use the water for the fusilli). Once the sweet corn is done, kernal the corn and set aside. Boil the Tricolour Fusilli until al dente, drain well and set aside. Wash the cucumber throughly and remove the seeds (leave the skin on). Dice them and set aside. The fun starts after the above preparation is done. Get a sturdy and reasonable-sized mixing bowl and ask your child to put the cooked ingredients into the mixing bowl. Dawn choose the different items and placed them into the mixing bowl. She loves squeezing the salad cream from the bottle and mix them on her own. Simple, easy and a delicious way to involve your child! This entry was posted in BZ Kitchen, Bzmommyhood, Child Friendly Recipes, Salad / Side Dishes / Ban Chan and tagged Kids-Friendly Activities, Kitchen Fun Time, Recipes. ← Oh, My Favourite SKECHERS!